Stuie Neale: Wow, Felix Loch is beaten! Alistair Williams:Yesssss! GOLD for Austria! First Luge singles gold in 50 years! Matthew Pinsent, part of our BBC team out in South Korea, can't believe that Loch has not won gold. Loch's misery is delight for David Gleirscher. The Austrian, who has never won a World Cup event, takes the gold medal. American Chris Mazdzer picks up the silver medal, with Johannes Ludwig of Germany winning a bronze. Loch's error means he is down in only fifth position. Felix Loch was the man in charge, he was in complete control of this competition. He looked to have the gold medal in the bag. 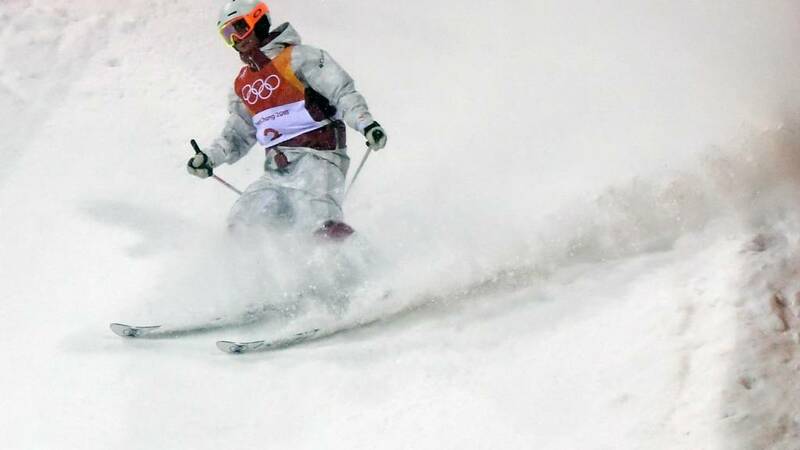 But a huge error during his run has ruined not only his fourth run, but also his hopes of a medal. Great drama in Pyeongchang. We also have some ice hockey going on as Canada are taking on Olympic Athletes from Russia in their women's preliminary round Group A tie. That one is in the second period, with Canada 3-0 up and in complete control. A third gold in a row coming for Loch? The last medal of day two to be awarded comes in the men's singles in the luge. Germany's Felix Loch, a two-time champion, is the man in the lead, and, ominously for the competition, he is getting faster with his third run earlier today better than his two efforts yesterday. That is where we are going now on BBC One. Perrine Laffont was super fast through the run but it was her turns that did it. Her coach knew it at the time that she had nailed it. France kick-start their Winter Olympics with gold in the women's moguls. The 19-year-old is the Olympic champion. It's just beginning to sink in for Perrine Laffont. It's been a good day for the Canadians too but the night belongs to Laffont. She becomes the first French woman ever to win the Olympic moguls. Andi Naude of Canada is the only one who can deny Perrine Laffont. Naude is the last to go, but loses control, goes wide and bounces, agonisingly, off the course to end her medal hopes. Laffont, 19, becomes the first French woman to win the moguls at a Winter Olympics. Canada's Justine Dufour-Lapointe has to settle for a silver after gold four years ago. Yulia Galysheva of Kazakhstan takes bronze. How to keep warm in Pyeongchang. Dress up as a Gallic Rooster, the unofficial national symbol of France. The French are guaranteed their first medal of these Games with Perrine Laffont now leading in the moguls. Two to come. Defending champion Justine Dufour-Lapointe of Canada leads the way in the moguls, with only three women to go. Just how cold is it in Pyeongchang? Icicles-on-beard-cold, that's how cold. The final six are going for glory in the moguls. It is taking place in a heavy snow shower, just to make things that bit more difficult. Live on BBC One now. Andrew Musgrave may well have claimed Britain's best ever cross-country skiing result when he came seventh in the 15km +15km skiathlon earlier on, but he is still hoping for more in future. You have to keep warm any way possible. And our team out in Pyeongchang are doing everything they can to stay warm. Another picture of a youngster starting early in their Winter Olympics career. Very early in the case of five-week-old Georgia. One of these six competitors will win the gold medal in the ladies' moguls. They all advance into the last part of the final, which is due to start in 10 minutes' time. Ross Pepper: Whose idea was it to put speed bumps on a ski slope? While we watch the women's moguls on BBC One, we also have action of the early stages of the fourth run in the men's singles in the luge. Only 20 men remain, and they go in reverse order, meaning Germany's Felix Loch, who leads the way, goes last.